When it comes to the Grand Carousel at Kennywood, Philadelphia’s loss was Pittsburgh’s gain. Originally built by William Dentzel for Philadelphia’s sesquicentennial in 1926, the carousel wasn’t finished in time and was offered to Kennywood Park instead. Dentzel built Kennywood’s first carousel, and the park bought his new one for $25,000. Unfortunately, park officials didn’t realize before they purchased it that the carousel, at 54 feet in diameter, was too large to be installed in the existing carousel pavilion. A new carousel building was constructed to accommodate it and cost $10,000. The carousel has four rows of animals. Most of them are horses, some of which are stationary while most rise and fall. There is also a lion, a tiger and four chariots. Since it has animals other than horses, it is classified as a menagerie carousel. The carousel revolves to the music provided by a 1916 Wurlitzer band organ. 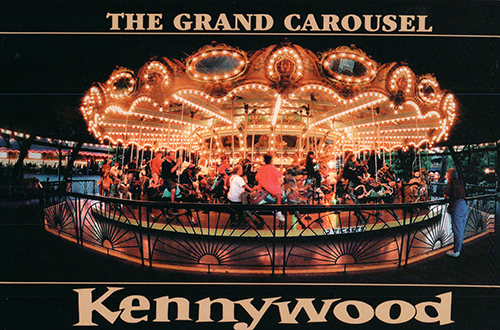 In 1976, the carousel was designated a historic landmark and has provided joy for generations of Kennywood visitors.